Candy, Candy, Candy, our Bunco chews placed in the Bunco Mug for the world of Bunco Entusiasts. What more can your ask for when the candy is gone you can have coffee or tea. 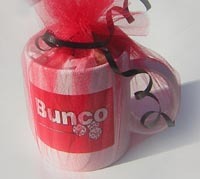 Enjoy your Bunco Mug after the candy is gone. What fun! It's Time. It's Time for Tea.